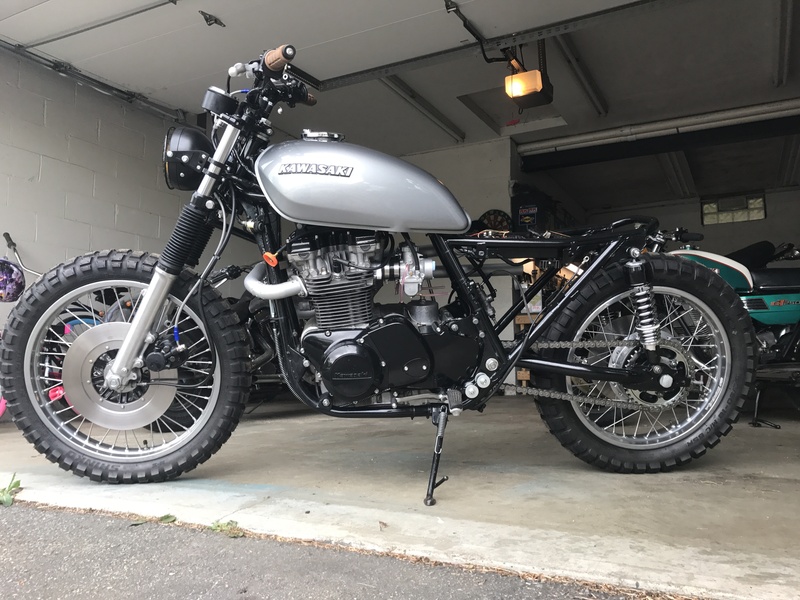 So I started this project over 9 months ago, with a vision to finally build an aggressive on and offroad tracker, more focus to the on road part Over last winter much of it came together, I have some of the more notable changes listed below as well as the more subtle differences. 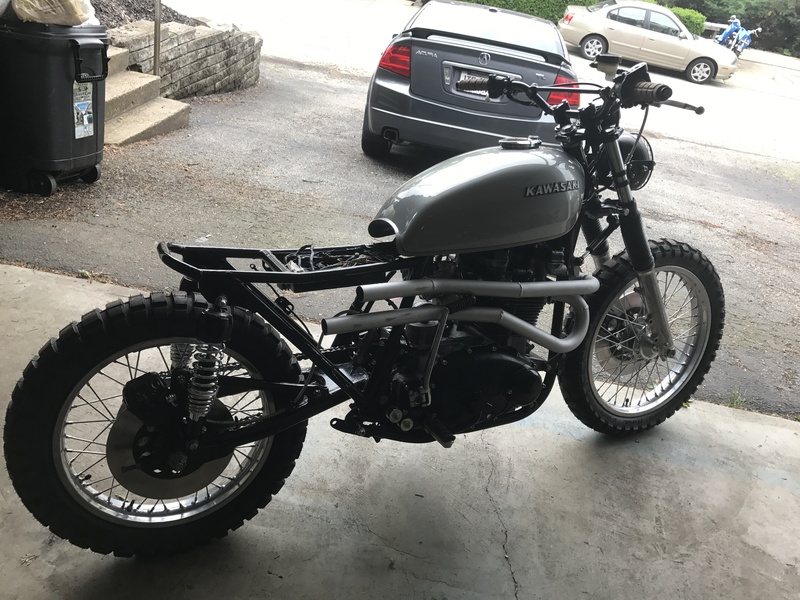 The way things stand right now limits my time with kids/work/etc, but this is my third build so I'm driven to finish before mid July (Pittsburgh Vintage Grand Prix Show). 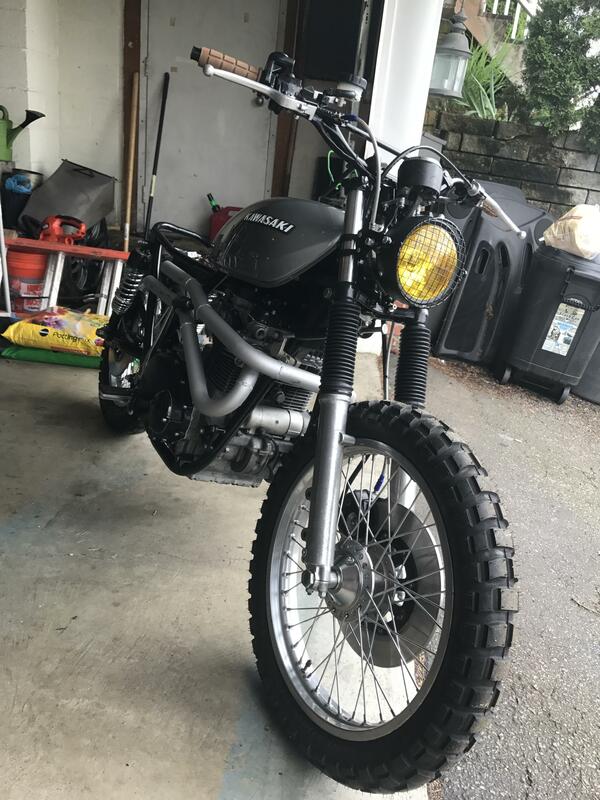 Let me know what you guys think, first time sharing on these forums! 14. Powdercoated wheels, frame, triples, bars, hubs, brackets, mounts, EVERYTHING. 15. Tank sealed with POR15 then prepped and repainted in 2009 Mercedes Benz SLR Crystal Laurite Silver, finished with a new oem gas cap and seal. 29. Oury brown grips for that soft touch. 30. Loads of other stuff I'm forgetting, so many late nights in the garage....there is almost nothing left untouched except the bottom end of the motor. As she stands right now (5/31/17) Waiting on extended throttle cables, oil breather, seat foam, and new slim battery. Rear master cyl needs linkage fabbed. Thanks guys, hope you like it! Come see me and the kawi at the 2017 Pittsburgh Vintage GP July 15th-16th! Nice work. I love these bikes too. Nice to see another one done. The great thing is that they are all unique builds. I'll be visiting your link. Stellar! Those pipes are killer...did you make them? 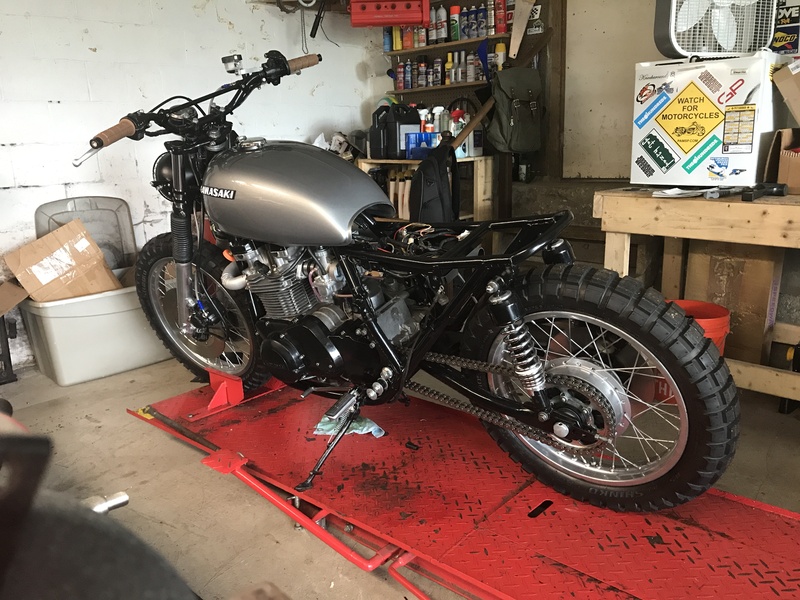 I'm doing a KZ750 cafe build. Most motorcycle problems are caused by the nut that connects the handlebars to the seat. Awesome work man! Good to see more Pittsburgh folks doing cool stuff. Looks like fun! Hope to see more progress. Also from Pittsburgh. South Hills area.